Hope your week has been moving along well so far! I finally got into my craft room yesterday (after way too many days away) and got right to work on this sketch from Freshly Made Sketches. I am the hostess this week and I went with a sketch that leave open space to be filled with whatever you want. I opted for this pretty flower from Altenew. How is your crafty mojo when you have taken a big break from making stuff? I have to admit that mine seems to be a little slow off the starting block. So I went with my happy place and chose to watercolor. This flower from Botanical Garden (Altenew) is so pretty, don’t you think? I used my Zig Clean Color Pens to color it. The flower was first stamped in Versamark and then heat embossed with Gold Stampin’ Emboss Powder. I think it adds an elegant touch. For the little sentiment banner, I pulled out a brand new stamp that I got from Skipping Stones Design called Healing Wings. I’ll be doing more with sets from this company in the upcoming weeks so stay tuned for more on that. I just thought this sentiment was perfect! Actually, I can see me using this sentiment A LOT!!! I added a strip of gold DSP down the side and put the card on a Night of Navy base. You can see the gold a bit better in this flat picture…it really adds a touch of elegance to an otherwise simple design. I hope that you enjoy this sketch. The team has done their usual amazing work and their interpretations are sure to inspire! Next post: April Fancy Friday – Anything but a card! I love the sentiment as well…..so true! This is lovely! 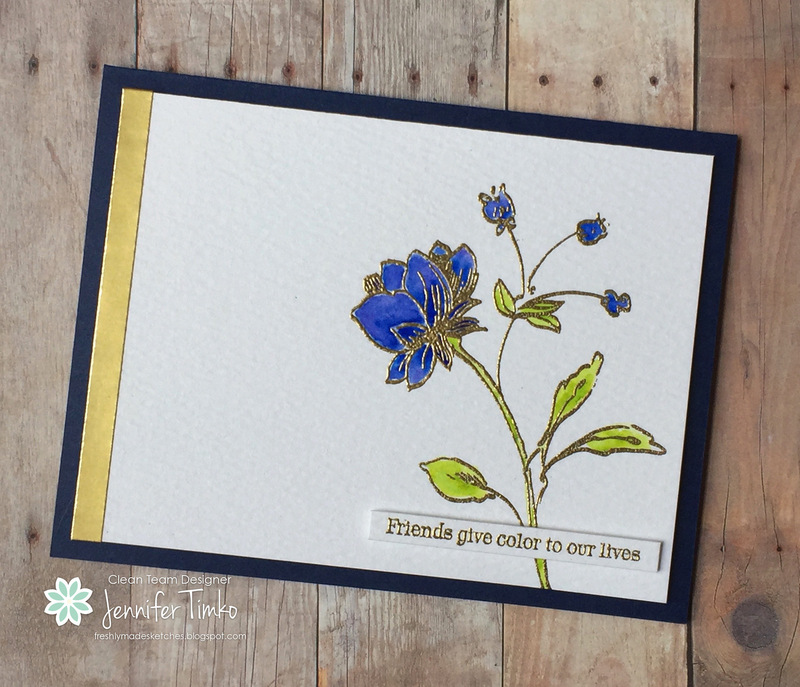 The gold with the navy is so elegant and I love the bright blue flowers! This is beautiful and oh so elegant! The white space you’ve left on the main panel really helps draw the eye to that gorgeous flower. I just love the gold on this. From the outline of the stamp to the gold strip down the side this is so elegant. 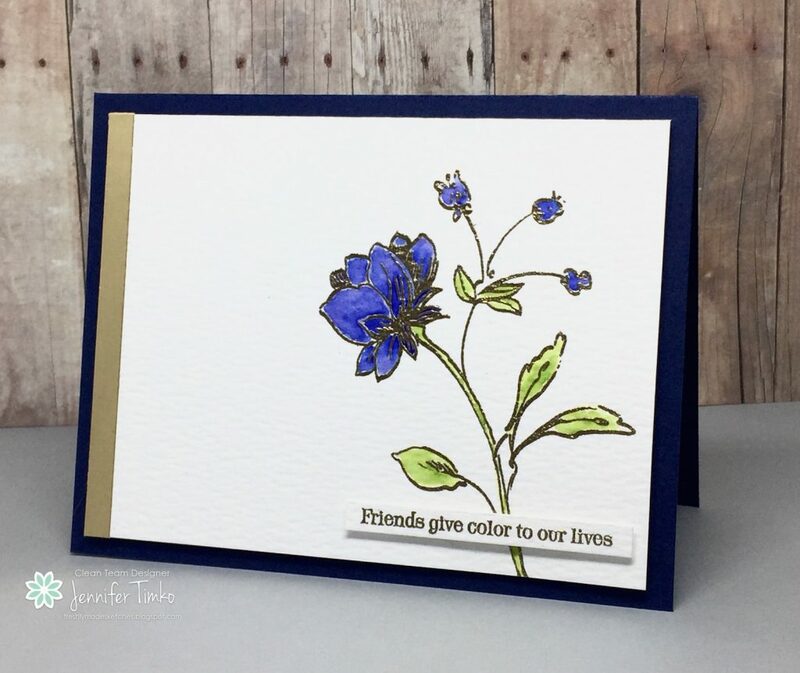 Such a pretty card Jen! I love those flowers! The colours are so rich! Love the gold embossing too! Just gorgeous! This is lovely Jennifer! The gold embossing is such a striking touch and your colouring is perfect!